Kurisupara, Kallar – Mangulam Road, Munnar, Idukki Dt. Use the form below to inquire about Scenic Forest Resort At Kurisupara . Use the form below to reserve for Scenic Forest Resort At Kurisupara . The Scenic Forest Resort at Kurisupara, with waterfall, stream & surreal surroundings is a perfect family retreat. Munnar is a mystically serene land with mountains valleys, streams, forests, dense vegetation, spice plantations, various flora and fauna, mighty dams, stunning lakes, and chilly weather that has been beckoning travelers for centuries. In Kurisupara, one of Munnar’s secluded misty forest lies this scenic resort. Studded with comfortable accommodation and warm hospitality, this resort is thoughtfully constructed far away from all the maddening congestion caused due to the tourism explosion at Munnar. At sunrise, streaks of sun rays peeking through the tall trees and mist stage a spectacular drama by illuminating the entire ambiance with their bold rays on this Scenic Forest Resort at Kurisupara. The rustic exterior of this secluded resort merges effortlessly into the environment with balconies and patios that extend up to the lush greenery. Lightings and furnishings are maintained in wooden and amber tones to provide an earthy hue to rooms that are appointed with all modern luxuries. Every room overlooks the sprawling spice plantation and offers relaxing sights of the tinkling stream and the frothing waterfall that soothes the ears, eyes, and soul equally. The spacious veranda in every room is the perfect spot to kick back and relax in nature’s company. Guests can spend hours here with a book or simply unwind in the company of nature. Some of the rooms have their own private gardens. The accommodations are exclusive as only a few rooms are spread across a large estate with plantations of coffee and cardamom. The eight standard suites and two bedroom suites also ensure total privacy. Mouth watering Kerala cuisine, continental, and Indian delicacies are served at a scenically set restaurant. To strike an unforgettable rendezvous with the gigantic forest trees, food can be served outdoors in the garden or on your balcony. The conference hall at the resort accommodates up to 50 guests and has been a popular venue for many corporate meetings and social events. If guests want to experience the wilderness of the outdoors in a more mesmerizing setting, outdoor parties with barbecue and campfire can be arranged at this Scenic Forest Resort at Kurisupara. As per the chosen package. CP – Room + Breakfast. MAP – Room + Breakfast, lunch or dinner. AP – Room + Breakfast, lunch, and dinner. Peak season supplement (20th December to 05th January) will apply. Check-in time is 12.00 noon and check out time is 10.00 am. There are plenty of activities to challenge your body and mind if that is what your heart desires. The resort assists guests on a guided nature walk and plantation tour. These strolls are a refreshing and enlightening experience, letting you inhale clean and clear air and understand how fascinating the spice plantation procedures are. These trips open the mind to the refreshing aroma of raw spices and the processes of planting, cultivating, and harvesting cardamom and coffee. Mountain biking, cycling through the resort, a refreshing swim in the mountain stream, long soak in the natural pool, trekking through the streams ,camping in the woods , a thrilling jeep ride over the rugged terrain are other outdoor activities that you can try your hand at during your stay at this scenic forest resort. For indoor recreation, board games, chess, caroms, table tennis etc are provided. Outdoor games like badminton and volley ball are also available. There is a children’s park with swings, slides, see-saws, and a small fish pond that will keep the little ones occupied. The spice shop at the resort stocks aromatic cardamom, pepper, and coffee. These spices are from the in house plantation and thus, are extremely fresh and reasonably priced. Tea and other spices at the spice shop are collected fresh from the local market .Shopping at this exotic spice shop is a must do activity. Apart from exhilarating and rejuvenating activities within the resort premises, set out to explore Munnar and its spectacular scenic beauty. Wildlife at Eravikulam National Park and Chinnar Wildlife Sanctuary are a must visit. If you are lucky, you might get to see the blooms of Nilakkurunji that blossom every 12 years and paint the hills and meadows with hues of purple. The endangered Nilgiri Tahr roams free at the National Park at Munnar. Kollukkamalai which is the highest tea garden in India, tea museum, boating at Mattuppetti dam, top station view point, Lakkom waterfalls, Briar bridge, Rajamala, and Marayoor sandalwood forest are some of the popular tourist attractions of Munnar. Kochi is the nearest airport to Munnar. From Kochi, Kurisupara is about 125 km (appx 4 hours). From Kochi, drive on NH 85 towards Muvattupuzha. From Muvattupuzha, take the Pothanicad Road and drive east. After reaching Pothanicad, continue on the same road until Paingottoor. After Paingottoor, take the Muvattupuzha_Theni road, which is also SH 43. Drive on SH 43 crossing Kadavoor and Vannappuram until the town of Churuli. At Churuli, take SH40. Stay on SH 40 until you reach Kurisupara, ahead of you at about 30 km (appx 30 mins). 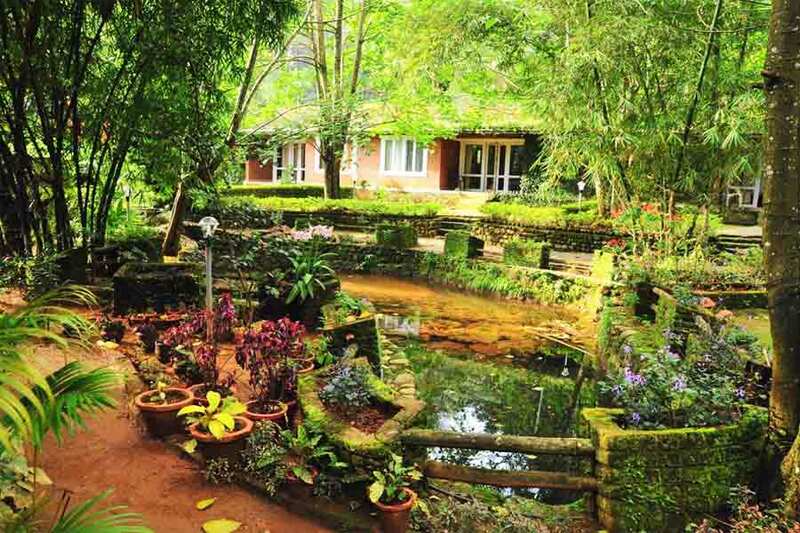 Stay: Scenic Forest Resort At Kurisupara Address: Kurisupara, Kallar – Mangulam Road, Munnar, Idukki Dt.